In celebration of her tenth anniversary in the field, Daniela has compiled her most compelling anecdotes, stories and thoughts into one volume, Striking a Balance: Reflections on What Matters. This insightful book will enable you to gain a new perspective by reading Daniela’s experiences and those of her clients. By reflecting on all aspects of life from the big issues, including gratitude, risk-taking and strategizing to the everyday details from organization to budgeting, Striking a Balance lays out how your success can be attained both personally and professionally. 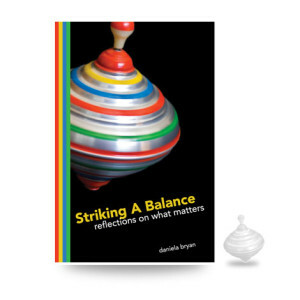 Order Striking a Balance: Reflections on What Matters and discover how you can transform your life into the one that you have always envisioned. Contact me about coaching, facilitating or speaking.